Wow, I can’t believe how much I’ve slacked off on my blogging! First I hadn’t been feeling well…even having to call out sick from work, which I haven’t done in over 2 years!! Then life just got busy with a party for Hubby’s Motor Cycle Club & a girl’s getaway to Atlantic City…the Blog had to take a back seat! Anyway, despite my illness, fatigue and busy schedule, I still managed to cook a few good meals and even snap a picture here and there. So what’s the best kind of meal to make when you don’t feel like cooking?? A Crockpot /slow cooker meal, of course! 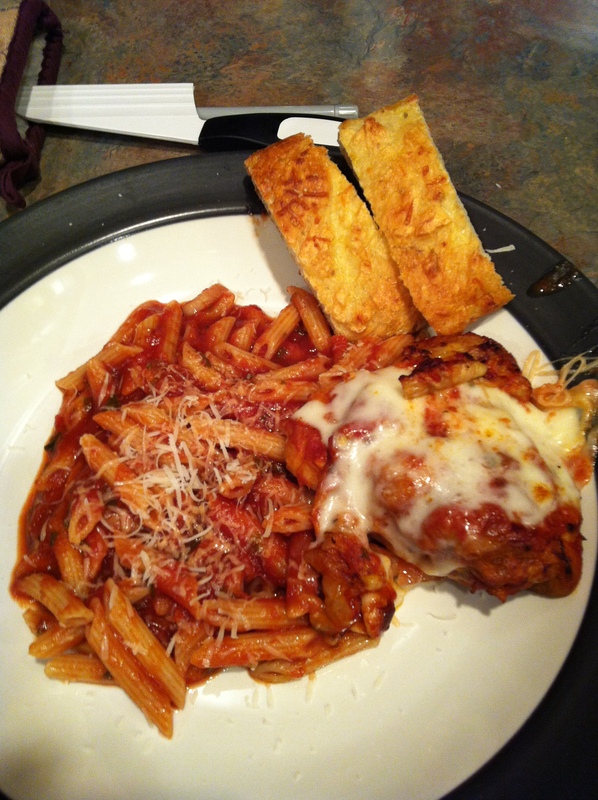 My inspiration for this recipe is from the Pioneer Woman, Ree Drummand. 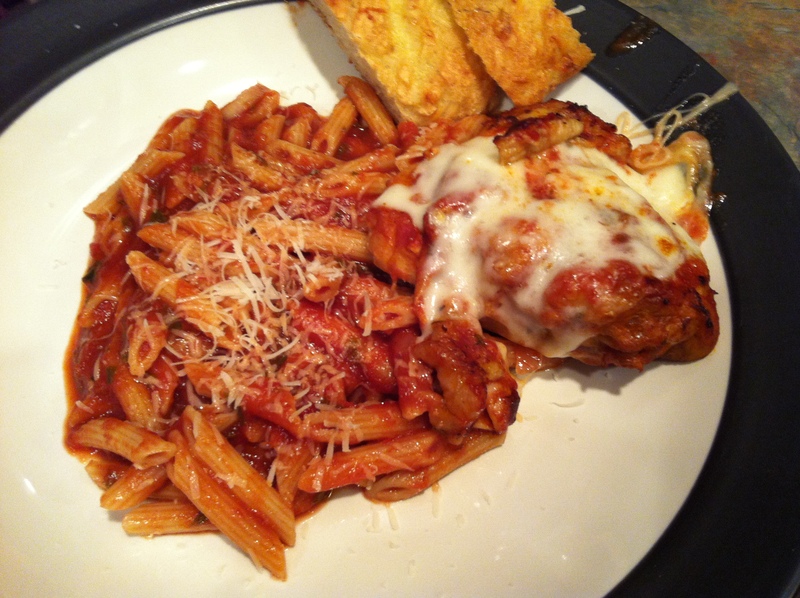 The original recipe, Penne with Chicken Thighs, call for the thighs to be cooked in the oven for 1 ½ hours, so I figured why not just throw it in the Crockpot. Be careful with how long you cook this in the slow cooker, though. Even with the low heat of a slow cooker chicken can and will get dried out if left in too long. So, I wouldn’t recommend this as one of those that you start in the morning so it’s done when you return home. It will only take about 2 hours on high (or low if your crockpot runs a little hot…which mine does.) After 2-3 hours use a meat thermometer to make sure the chicken has been cooked through. Remember cooking times are approximate and you can never be sure if meat is cooked thoroughly without taking the temperature. 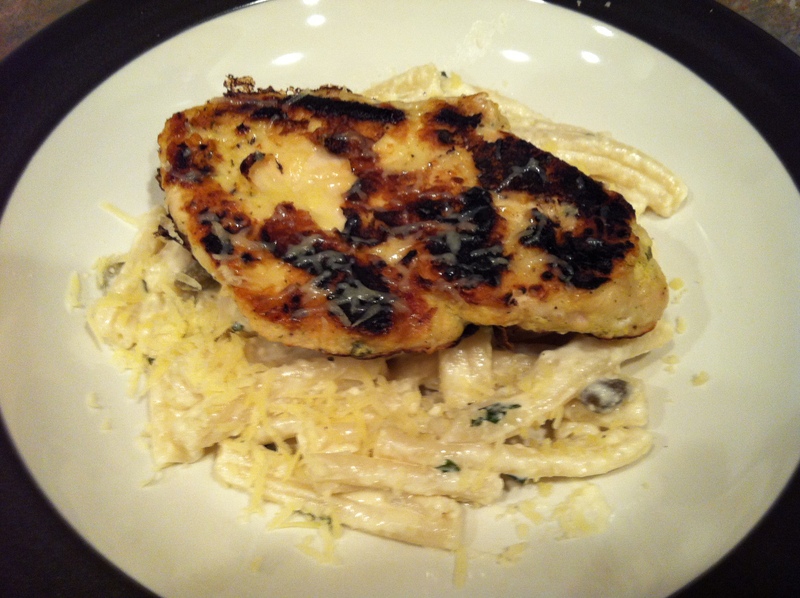 Serve the chicken thighs with any pasta that you like or have on hand. I recommend using my Marina Sauce, but you can use jar spaghetti/marinara if you want to. Season the chicken thighs with the salt, pepper, and Italian seasoning. Heat the oil in a skillet and brown the chicken thighs on both sides (about 3-5 minutes per side). Transfer to the slow cooker and add the marinara sauce. Cook the chicken thighs in the slow cooker for 2 hours on high or 3-4 hours on low (this depends solely on your slow cooker). 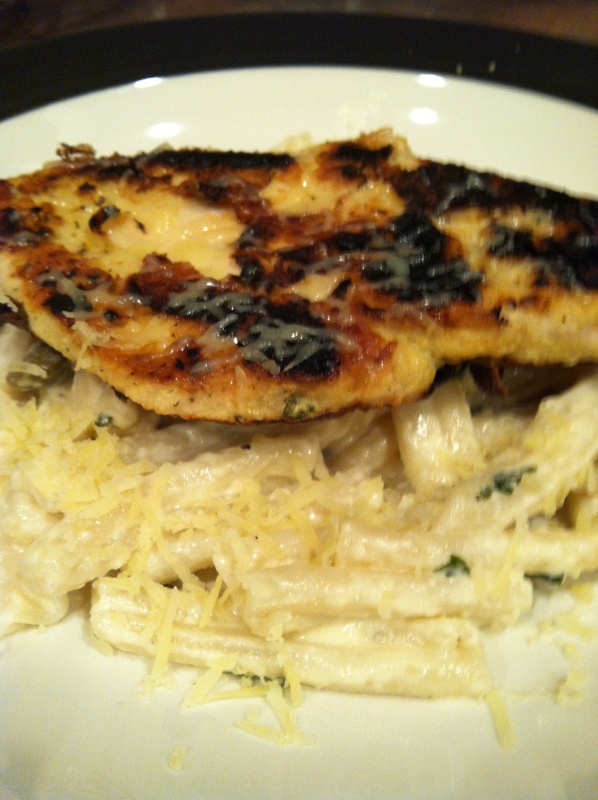 When chicken is cooked through serve over cooked pasta of your choice and sprinkle with the parmesan cheese. At one of our recent trips to Whole Foods, I picked up a pack of Naan to serve as a side for our dinner. I was surprised how good it was…better than some restaurants I’ve even been to. Maybe it was because it was flavored with garlic & herbs. I’m not sure, but I fell in love. 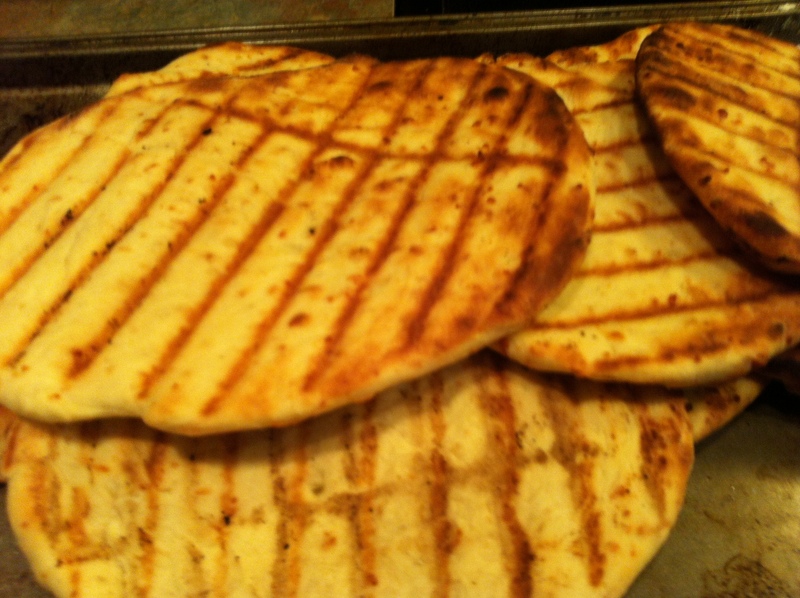 When I ran out and I didn’t want to go to the store to get more I hit the internet to see if Naan is hard to make. Of course, since I don’t have a traditional Indian Tandoori oven I knew it wouldn’t be exactly the same, but thought it was worth a shot. I found this recipe on the Budget Bytes Blog and thought it looked pretty simple, plus it called for all ingredients I had on hand. I modified it by adding some garlic & cheese so it would be like the kind I purchased at Whole Foods. I cooked it up on the grill and it tasted almost as good as if it had been made in the traditional way. I froze what we didn’t use and when I want to use it I just take out a piece or two at a time. It freezes really well so you can definitely make a big batch if you’re feeling ambitious. You can use it as a side to kabobs and rice or an accompaniment to any meal. You can also be creative and use it for sandwiches and pizza. 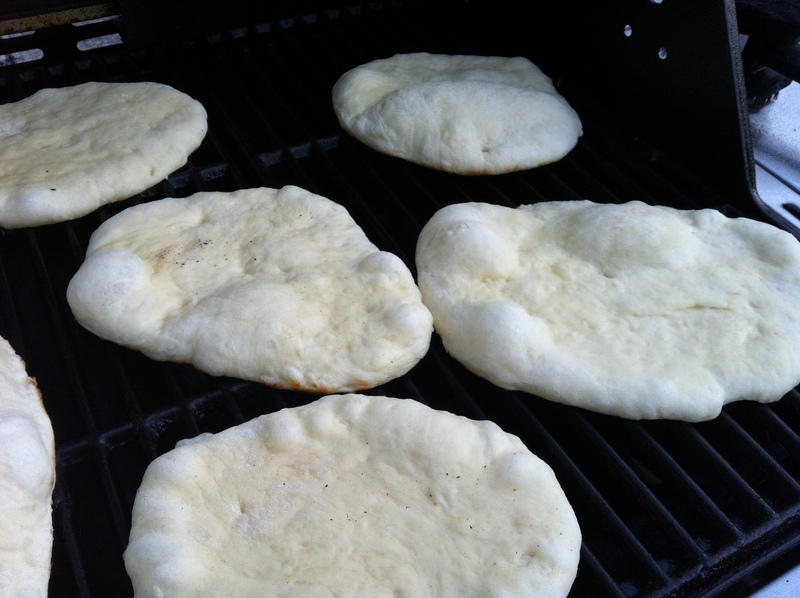 For plain Naan, just omit the garlic and parmesan cheese. In the bowl of a stand mixer combine the yeast, sugar and water. Stir until the yeast and sugar dissolve and allow to sit for about 5 minutes or until it looks “frothy”. Add the oil, yogurt and egg and mix on very low speed (using the paddle attachment) until just combined. Switch the paddle attachment to the dough hook attachment. Turn the mixer on low speed and add the salt, garlic, cheese and 1 cup of floor. Continue to mix on low, adding ½ cup of flour at a time until a smooth ball is formed. Knead the ball of dough in the mixer for about 3 minutes. The dough should be smooth and very soft, but not sticky. Cover the dough loosely and allow to rise until double in size. After the dough rises, flatten the dough and cut into 8 pieces. Shape each piece into a small ball. Roll out the balls of dough to about 1/4 “ thick. Preaheat the grill to medium. Brush the dough with olive oil, if desired, and place over indirect heat. Allow the dough to cook until brown and bubbles form. Flip the dough over and allow the other side to brown and bubble. Serve hot.